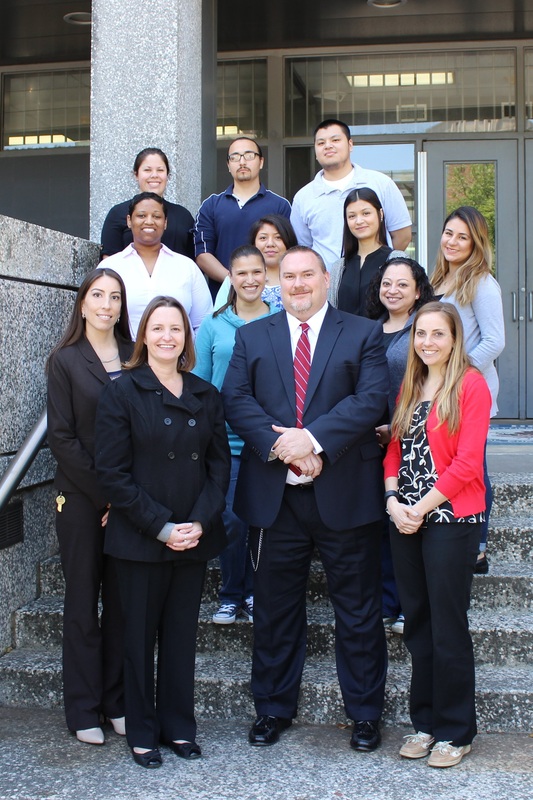 As part of an optional extra credit opportunity, Rebecca Pfeffer, University of Houston-Downtown (UHD) assistant professor in the Department of Criminal Justice, organized a visit to the Federal Detention Center of Houston for students enrolled in her Crime, Law and Society and Human Trafficking class. The students were chaperoned by Pfeffer and Dr. Ashley Blackburn, an associate professor also in the Department of Criminal Justice. The students met the warden and his assistant, a staff psychologist, and a special investigator. Students toured the men's and women's units, the recreation yard, dining halls, living spaces, classroom areas and medical facilities. "Students learned that each inmate is screened for health problems when they arrive," said Pfeffer. "There is a medical and dental staff, and the jail is equipped with modern technology, including dental X-ray machines. They also saw the special rooms used for inmates deemed suicide risks, and learned other inmates can be paid to monitor those at risk around the clock." "Students heard from Warden Mike Pearce," Pfeffer added. "The warden explained how federal facilities differ from state and county jail facilities, and how this unit is unique when compared to other federal institutions." Students said they had an enriching experience and enjoyed getting a behind-the-scenes look inside the jail. "This tour was interesting and eye opening—I learned a lot," said Criminal Justice student Jessly Perez. "It was my first time going to a jail and I will definitely research more about jails in our city and country. I loved this experience and I'm looking forward to visiting another prison or jail in the future as a UHD CJ student." Other students were stunned by the number of benefits the inmates receive. "The most shocking experience to me was how well the inmates live," said Martin Valdez. "The inmates have the opportunity to get an education or learn a trade. For example, males had the privilege of working with leather to make purses and belts and women learned how to knit. The whole system was very organized and professional." Kelly Cruz added, "I was amazed at the health care provided to the inmates." Students also enjoyed a special presentation delivered by Special Investigator Randall Calhoun. Calhoun meets with every new inmate to determine any gang affiliation. Melissa Vences commented, "Everyone was knowledgeable in their subject, especially the special jail investigator. I gained so much information and insight from him. This was such a rewarding experience." A tour of the booking room concluded the students' visit, where they observed as a group of inmates were processed into the facility. Pfeffer thanked everyone in the Detention Center for making the field trip possible and providing an exceptional, educational experience.